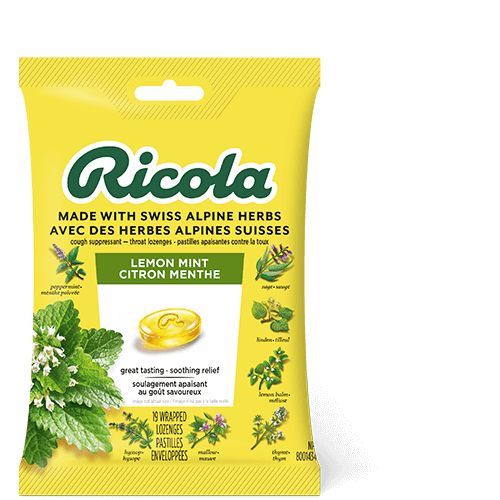 Medicinal ingredients: Each lozenge contains: Extract of Ricola’s herb mixture 23.19 mg: lemon balm (Melissa officinalis) aerials 14.50 mg [1.25:1, QCE 18.13 mg], peppermint (Mentha piperita) aerials 2.90 mg [1.25:1, QCE 3.63 mg], thyme (Thymus vulgaris) aerials 1.70 mg [1.25:1, QCE 2.13 mg], sage (Salvia officinalis) aerials 1.55 mg [1.25:1, QCE 1.94 mg], hyssop (Hyssopus officinalis) aerials 1.55 mg [1.25:1, QCE 1.94 mg], elder (Sambucus nigra) flower 0.30 mg [1.25:1, QCE 0.38 mg], linden (Tilia cordata) flower 0.30 mg [1.25:1, QCE 0.38 mg], wild thyme (Thymus serpyllum) aerials 0.13 mg [1.25:1, QCE 0.16 mg], horehound (Marrubium vulgare) aerials 0.13 mg [1.25:1, QCE 0.16 mg], mallow (Malva silvestris) leaves 0.13 mg [1.25:1, QCE 0.16 mg]. QCE = Quantity crude equivalent. Menthol (mint leaf) 0.78 mg, peppermint oil (menthae piperitae aetheroleum), peppermint leaf (50% Menthol) 1.46 mg.
Non-medicinal ingredients: Sugar, glucose syrup, citric acid, natural flavour (lemon oil), colourant (beta-carotene). Duration of use: Consult a health care practitioner if symptoms persist beyond one week. Consult a health care practitioner prior to use if you have gallstones, anemia, hiatus hernia or gastroesophageal reflux. 7 days or is accompanied by high fever consult a doctor.